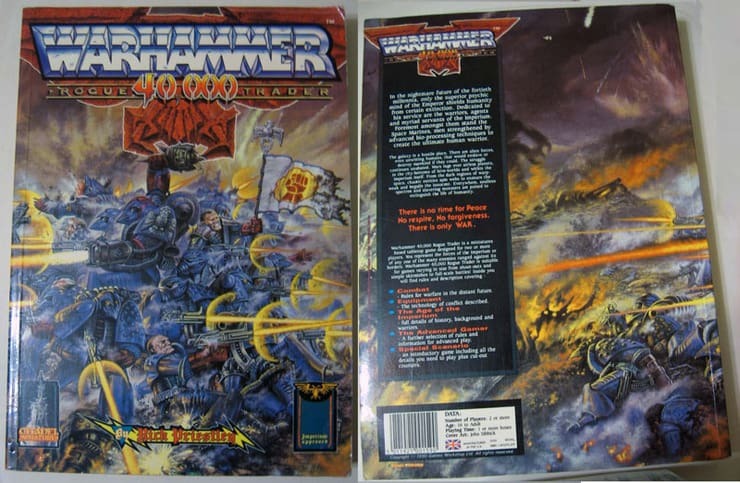 A classic metal album set in the most “metal” universe of all: Warhammer 40k. This week will feature my first column-based review, Bolt Thrower’s Realm of Chaos. I have heard this album in the past, but don’t remember it very well, which lead me to purchasing it a few days ago. Plus, Warhammer 40k is one of my favorite Sci-Fi universes. Death metal is the perfect genre for a setting where the tagline is “in the grim darkness of the far future, there is only war”. Bolt Thrower is a death metal band from Coventry, England, and formed in 1986. They released their first full length, In Battle There is No Law, two years later, but it wasn’t until their second album, 1989’s Realm of Chaos, that their death metal sound solidified. This release was among several which changed the landscape of extreme metal, alongside Death’s Scream Bloody Gore and Possessed’s Seven Churches. Bolt Thrower, though split up now, featured many members throughout their long career, so I’ll mention the most prominent ones. Karl Willetts and Dave Ingram for vocals, Andrew Whale and Martin Kearns (RIP) on drums, Gavin Ward on guitars, and Jo Bench on bass. First up is the short intro, “Intro”. Starting with some menacing ambient sound, there is some dialog describing war in the far future. I generally find tracks like these useless, so this one is a write-off for me. Next up is “Eternal War”. Opening immediately with a dirty riff and double bass, this is definitely the sound of early death metal. Only 36 seconds in, the blastbeats come in, showing Bolt Thrower’s grindcore influence. This song is only 2 minutes long, further cementing that pedigree. Decent opener but nothing special overall. “Through The Eye Of Terror” opens with a killer, slow riff, like a regiment of Leman Russ tanks slowly rolling towards a Chaos-held hive city, while Willetts lets out a roar reminiscent of Chaos Daemon. The riffs and drumming get faster bit by bit, until the offensive culminates in another blastbeat grind segment, the drums Imperial Guard lasguns firing into heretic ranks. Changing tempo multiple times, the song progresses like the back and forth tides of a battle. This song is just as amazing as I remember! “Dark Millennium” is another short one, but the dirty death metal sound of “Through The Eye Of Terror” comes through strongly. This song is perfectly balanced, and continues the strong start from “Through The Eye Of Terror”. Next is “All That Remains”, which opens with a doom-y, slow riff. 58 seconds in, the riff speeds up, like an unruly mob of Orks getting themselves worked up for battle. The track stays fast throughout, until the end. Another great track. “Lost Souls Domain” opens with a menacing drum patterns, and another growl, basically a faster version of “Through The Eye Of Terror”. Very similar track, sharp riffs and double bass in spades – or shall I say trench shovels? “Plague Bearer” is in the same vein as “Eternal War”. Very straightforward and aggressive, basically interchangeable with that one. “World Eater” I remember very clearly, as with “Through The Eye Of Terror”. Both of these were my favorites from previous listens, the riffs are sheer headbanging material. The fade-out ending riff of “World Eater” is the first instance of the infamous “Bolt Thrower riff” as seen in the other tracks “Embers”, “Powder Burns”, and my favorite BT track of all, “The Killchain”. “Drowned in Torment” features some mildly Nile-esque guitar tones right in the beginning, which was an interesting touch. However, this track is similar to “Eternal War” and “Plague Bearer” in it’s ferocious simplicity. “Realms of Chaos” opens with another sharp riff, again heavy towards the death metal side. The riffs in this one sound very similar to “Through The Eye Of Terror”, but that’s not a bad thing. “Prophet Of Hatred” is a solid death metal track, but once again falls into the generic category. Still good, though. “Outro” is another useless insert, mainly ambient noise. Nothing to say here. Overall, Bolt Thrower’s Realm of Chaos is a good album. The intro and outro could have been cut entirely, as they have no impact on the album’s vibe or musicality, but generally there was no bad songs. While several songs like “Eternal War”, “Plague Bearer”, and “Drowned in Torment” lean towards the generic side, I put that to the age of the album. Realm of Chaos was released when death metal was still finding it’s foothold, so that can be excused. On a side note, the album actually has two artworks for the cover, both of them from early Warhammer 40k. The one with the blue Space Marines is specifically from the Rogue Trader rulebook, and the Realms of Chaos title is from the rulebook titled “Realm of Chaos: Slaves to Darkness”. I have no idea what source the yellow cover is from, but it’s definitely from the same era of old, wacky 40k. Anyway, while the universe of Warhammer may be dark and hopeless, the memes are often not.